Giving back is what Sterling Sharp does! When you have the name Sterling Sharp, there is certainly a familiar ring to it. It’s the same name with a different spelling as the former All-Pro wide receiver who now appears on several football shows. This Sterling Sharp is in the Washington Nationals system as a starting pitcher for the Harrisburg Senators. The 23-year-old was the Washington Nationals 22nd round pick of the 2016 MLB draft from Drury University. Sharp grew up in the Detroit area and instead of relocating to a warmer climate in the off-season, he still makes his home in the same area. He had an idea of giving back to his community, and with the help his agent, girlfriend and family he has launched a charitable effort with Detroit PAL for the youth in Detroit to embrace baseball which is the sport that Sharp grew up loving, and now is what he gets to do full-time. For some background, Sharp was not a “bonus baby” and doesn’t drive a luxury car or live in a luxury rental during the season. 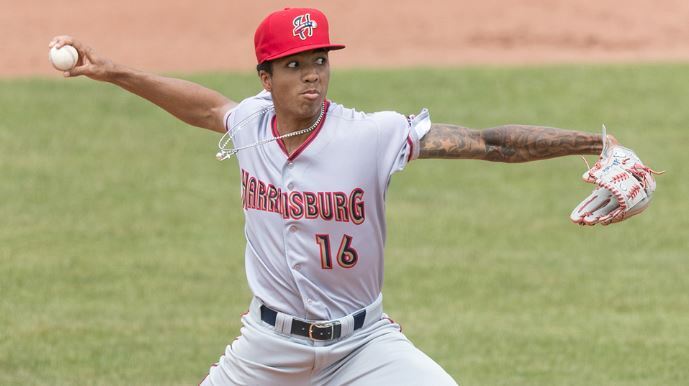 He is one of those underpaid Minor League players you have read about recently, and he lives with a “host” family in Harrisburg and most of his money is actually spent on food. But he wanted to give back, and he he has put a lot of time and his own money into this charitable effort. “The effort is about helping young black kids from the city of Detroit where we are underrepresented in baseball for many reasons and I want to help increase interest, awareness, access, and opportunity for” them,” Sharp told me. “I’ve been sitting on an idea like this since the end of last season, and I ran it by my fam, my girl and my agent. I got all their thoughts and I thought this was a good way to go about it. So I came up with this, and I didn’t want to sit on it any longer so we got it going. For example a person can choose their own amount to pledge per ground ball. It estimates it at 100, so people make their pledge based on that, and if for some reason it gets beyond or someone changes their mind, they can stop the pledge at any time (but obviously owe what’s already been pledged). So if you want to donate $50 in total to this, then you would pledge $.50 per ground ball. $1 for $100 total. Etc. So this is fun, and the effort is real. Some athletes talk about it, but Sharp has done it. As of this moment, the effort has raised a little over $1,500 and the modest goal is to raise $5,000. Hopefully, the numbers go far beyond $5,000. There are no indoor batting cages inside Detroit. The closest is in Southfield which is a couple miles northwest of Detroit. The lack of indoor facilities makes baseball more difficult in a cold weather city like Detroit. The Southfield batting cages opened just 2 years ago where Sharp gives off-season lessons. That facility is owned by the Fields’ brothers @AFHbaseball. They have 4 cages and 2 mounds in there. As Sharp’s success in baseball grows, he hopes to expand his charitable efforts further. Now that his season has started for the Harrisburg Senators, he is working on getting better each day. Sharp will make his second start of the season this weekend for Harrisburg. You might see him around town getting a bite to eat at the Appalachian Brewery which is a popular spot or better yet catch him at a game and count the groundball outs that are raising money for charity!